CMS announced QIES will be down three consecutive weekends. This impacts both MDS and PBJ submissions and comes right before the Feb 14 PBJ deadline. QIES historically gets very busy at the PBJ deadline, which affects MDS submissions. Between downtime and the PBJ due date, you should plan ahead for any critical deadlines. We recommend processing your batches up to two weeks before the deadline, providing you with ample time to resolve rejected files. Last-minute PBJ filers run the risk of not seeing their final Validation Report and running out of time to re-submit before the February 14 deadline. Submit your PBJ reports a few days earlier to avoid an automatic staffing One Star if your files don’t go through. 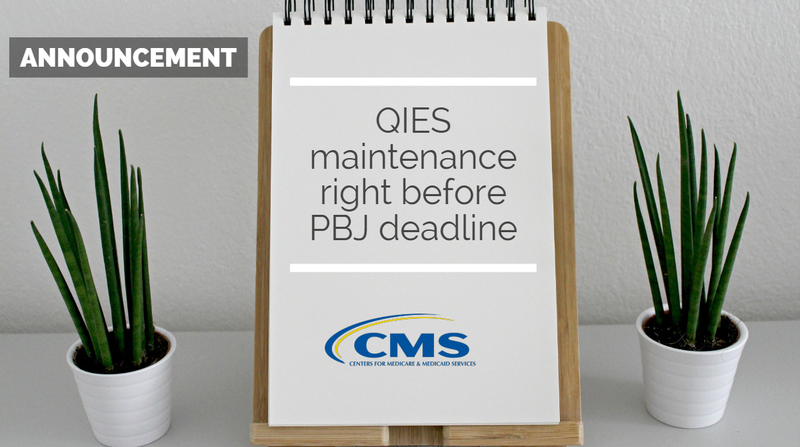 If you are doing PBJ data entry directly into QIES, we recommend assembling your PBJ report first in ezPBJ, then transmitting directly to CMS with us. Contact us to learn how ezPBJ can make PBJ compliance easier for you. ezPBJ is your one-stop shop for Payroll-Based Journal compliance, allowing you to assemble PBJ reports from all data sources, identify and fix errors/F-Tag issues, submit PBJ reports to CMS, manage CASPER reports, and more. Assemble and validate through ezPBJ so you don’t have to rely on QIES.